Schwamm who lived in a village, had a small son. He was very sensitive and reacts to the slightest irritation. Every morning on his way to school, he used to wait and wave at the passengers. But no one ever waved back. The boy felt hurt and on returning home, he was in a confused state. He could not do home work, did not want to play or talk to anyone. Sometimes he even broke into tears. His parents were very much worried about him. 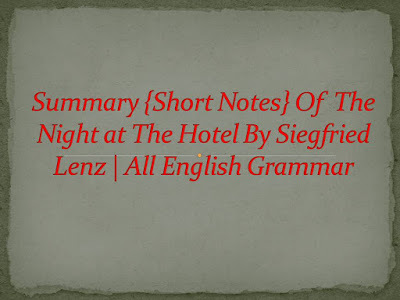 Night at The Hotel Short Story. Schwamm decided to make his son happy. So one day, he went to town to take the early train next day to wave back at his son. He went to a hotel and asked for a single room. The receptionist offered him a free bed in a double room. He advised Schwamm that he might not get even that bed if he tried elsewhere. He agreed and came to his room. The room was dark and he started searching for the light switch. The stranger in the room in the room requested him not to turn on the light. In order to avoid Schwamm falling over his crutches or run into his suit case, the stranger directed Schwamm to his bed. Schwamm introduced himself to the stranger. The stranger asked him if he had come there to attend a meeting. He said he had come there to take the early train and wave back at his son to make him feel happy. The stranger told him his unpleasant truth that his wife died giving birth to their first child and that he hated and avoided children. The next morning when Schwamm woke up, he was alone. He was shocked to see, it was time for the morning train and he had no chance to catch it. He returned home downhearted but surprised when his son met him at the door and threw himself at him. Te boy was proud and joyful. Schwamm knew from him that a man waved that day. He waved tying his handkerchief to a cane and holding it out of the window until the boy could not see it any longer. Schwamm understood that it was the stranger who shared the room with him.